I am working solo on a project, and would really like to have someone confirm my schematic before I buy the parts. I have studied the datasheets for everything, so I think this setup should work. I'd really appreciate any comments on this basic layout. I should note that I don't need to do any PWM switching on the solenoids. -control 12 solenoids (12v 10w push) from the arduino for use as a percussion instrument. The solenoids should actuate quickly off-on-off to get a nice percussive sound. Each solenoid will only be actuated once every 5 seconds maximum. 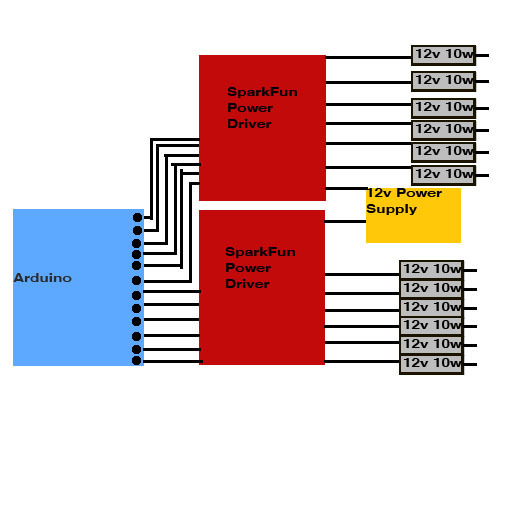 If you only ever push one solenoid at a time, a 12V 1A power supply might be sufficient. However, if you need to power multiples, you will want a much beefier power supply. I'd go for a 12V 10A supply (120 Watts) to make sure that it won't croak when you pull many of them at a time. Other than that, your diagram looks like it should work. I'm working on a similar project and I wonder, whether these SprakFun Power Drivers worked for your ?